Appendix C of Closure: The Definitive Guide. The wiki for plovr on code.google.com. Ultimately, information from the various online sources will be consolidated. Until then, this page contains a summary of how to use the most important features of plovr. It is up to you to upload sample-compiled.js to your static content server and to make sure that in production, the src attribute of your <script> tag points to sample-compiled.js. Config options are enumerated in the Java source code in ConfigOption.java. As plovr is evaluated by Closure developers, the names and JSON data types for these options may change, so until the API is frozen, the source code is the source of truth for what is expected. RAW Loads each input via its own <script> tag: does NOT run the Compiler, so no checks are performed. // acceptable values are "ERROR", "WARNING", and "OFF"
Remember, the names and values of the config file have not been finalized, so it may be necessary to monitor the plovr source code as new versions are released. Currently, the best way to learn how to use the modules feature of plovr is to examine the modules example in the plovr codebase. It is based off of the example in the "Partitioning Compiled Code into Modules" section in Chapter 12 of Closure: The Definitive Guide. In addition to the /compile URL introduced in the first section, there are other URLs that plovr serves to provide additional information. Some of these are listed on the plovr wiki page on Google Code, though the best way to get the complete list is by exploring the plovr source code. 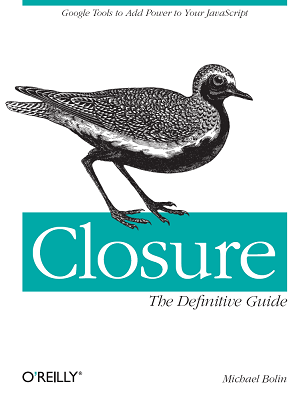 There is also more information on these features of plovr in Appendix C of Closure: The Definitive Guide.